The Lee Forum area includes land in both Lewisham and Greenwich Boroughs. 1. Reflect where people associate with through living, working, use of train stations, school catchments, church parishes, park, shop and library users etc in what they call ‘Lee’ (and to a some extent ‘Hither Green’). 2. Ensure greater amounts of cross ward communication and consultation for developments on the borders of wards and boroughs. 3. Ensure the people who can shape planning policies that guide developers and the council when making planning decisions are the people who will use and are close to the areas for which policies are created. 4. Ensure that Lee Green town centre is developed holistically, rather than as the outer reaches of three wards and two boroughs. 5. Enable Lee High Road to be similarly developed holistically rather than as the outer reaches of two wards. 1. People outside the town centre want a say in what happens there. 2. The concerns that people have over the town centre development are also felt over other sites such as Lee High Road, the Hither Green sidings, the Quaggy flood zones and other disparate sites. The Northern boundary of the Area goes beyond Lee High Road. 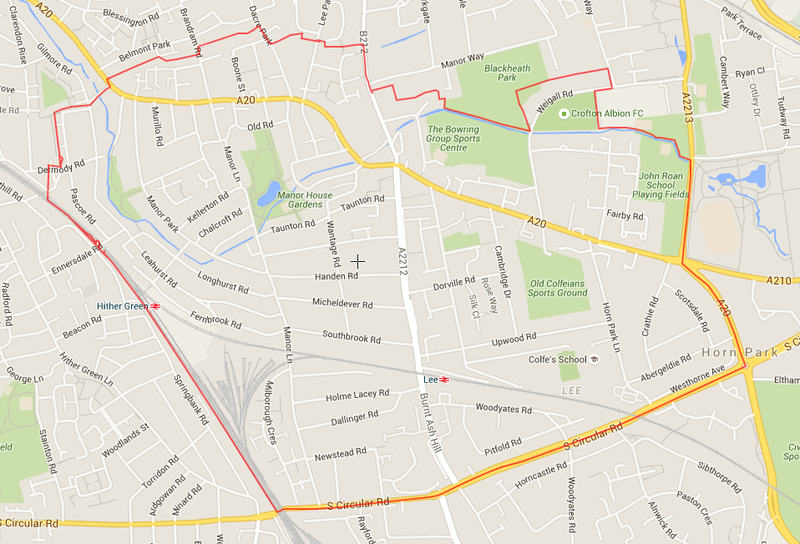 Most felt the forum should include some area further north of Lee Green’s Lee High Road boundary. Initial feedback showed some people felt the boundary should go as far as Lee Terrace and include the Cator Estate whilst others felt it should be much closer to Lee High Road. Following further consultation with the Blackheath Society, Cator and Page resident group members, councilors and residents and businesses on affected streets, it became clear that the boundary should not include the Cator Estate and that it should extend north of Lee High Road only to those streets most affected by its development. Since the boundary to the north encompasses people who associate both with Lee and Blackheath, the ‘significant interest’ membership clause allows those whose roads are not included in the forum to be a member of it, and we ask that any future Blackheath forum includes the same clause for those included in the Lee forum who want also to be members of a future Blackheath forum. The Eastern boundary includes all roads up to Kidbrooke Park Road which forms the boundary for the emerging Kidbrooke Village. Door knocking and residents groups in the proposed area show a strong view that the proposed area be included in the forum. Also that flood zones should be included since being a flood zone does not appear to protect an area from being developed. To the South of the area there is a natural boundary with St Mildred’s Road which is the boundary for the Grove Park Neighbourhood Area. Several people within Grove Park boundary have asked to be included in the Lee Green forum as they spend most of their time there. The ‘significant interest’ membership clause has been added for them. To the East is a natural boundary with the railway line and part of the Corbett Estate Neighbourhood Area. Initial feedback suggested that most people wanted most of Lee Green ward included, whilst some wanted areas that might be considered ‘Hither Green’ excluded. Further feedback from councilors, Users and Friends of Manor House Library, Lee Manor Society, Lee Green Local Plan members, FUSS and Manor Park Users group and residents and businesses on affected roads showed that most of the roads included in Lee Greed ward should be included, though not those in the Dermody and Pascoe Road area, where people associate more with the Lewisham. Creating a ‘Lee and Hither Green forum’ was considered and feedback from Hither Green Association was that they would be happy for roads on the West of the train tracks be included in the forum but canvassing of households suggested that more people in that area would choose to be in a possible future Lewisham forum. The significant interest clause allows people to the west of the train tracks to become members if they can show that the Lee Forum area is the main area that they associate with.